Here’s a question for you: What is the purpose of college athletics? I’m not sure I know the answer, but I’m willing to bet it changes depending on who you ask. I also bet that you won’t get an honest answer from everyone you ask. Books can (and have) been written on the topic, so I’m not going to dwell on it, except to say that we cannot deny that “money” is an answer that would come up a lot. I’d offer that any time universities are represented or showcased in any way, those representations should honor those universities’ values and the support they offer their students. I’d like to think that a university who has made a commitment to protecting its LGBT students from discrimination would then abstain from being represented in any way that compromises that commitment. Otherwise it’s an empty promise. With that context, let’s consider the news Pat Griffin broke this week. (If you don’t know Pat, she is a wonderful advocate for LGBT athletes.) On her blog yesterday, she pointed out that the NCAA is complicit in allowing Focus on the Family to run ads during CBS’s coverage of the upcoming Men’s Basketball Tournament. Such ads, spouting the same “Celebrate Family, Celebrate Life” message from the Superbowl Tim Tebow commercial, are already appearing on the NCAA’s website. Jeremy Hooper reminds us why Focus on the Family is a serious concern. They are virulently opposed to homosexuality and a woman’s right to choose. Jeremy did a search and found a ton of hurtful ex-gay propaganda on the FOF page. He also found that the top four headlines on FOF’s Citizenlink this morning were ALL about LGBT issues. This is an outrageous slap in the face to every LGBT person and their allies in athletics and to all other people who believe in a woman’s right to choose who are associated with the NCAA. Pat went on, this afternoon, to show just how flagrantly these ads violate the NCAA’s Advertising and Promotional Standards. Meanwhile, friend of the blog Sean Chapin had started a Facebook group to rally support and get folks to contact the NCAA. We learned this afternoon that the FOF ads have been pulled from the NCAA website. This is a great success, but I doubt this issue has seen its end. Focus on the Family will still be eager to include its television ads during March Madness. Perhaps the drama is over for the day, but my question is: where was higher education? There was not a peep on The Chronicle or Inside Higher Ed today (maybe blogs still aren’t seen as legitimate contributions?). I didn’t hear of any schools adding to the protest. Were they not concerned about the impact FOF would have on their students? So what is the role of college athletics? Today’s events suggest schools are not particularly concerned about the impact of athletics on students. It was up to bloggers and LGBT activists to respond. It’s disconcerting to think (or realize) just to what extent the money is taking priority. If a whole bunch of universities put out statements this week denouncing FOF and their ads, I’ll stand corrected. Until then, I’ll keep wagging my finger. Care about LGBT students or don’t care, universities. You have a choice. There are 1 Comments to "College Athletics, LGBT Students, and Money, Money, Money"
From what I’ve been able to determine, college athletics bring $$$ to schools. 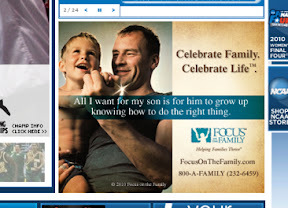 As to the ads, groups like FOTF get under the radar by billing themselves as “pro-family” charities, and they presume nobody will check into what they really are. Many people don’t, and it takes those in the know to alert them.